Almost every celebrity leads a lavish lifestyle, but extravagance doesn’t always translate to good taste, unfortunately. On occasions when the two are combined, the result is often stunning. If you have been planning a kitchen remodel for a while now but couldn’t really find the right inspiration for it yet, we have put together a list of celebrity kitchens for you that should give you enough ideas to improvise on. These are going to be some of the best instances of good taste brought to life with excellent professionalism and facilitated by an abundance of funds as well, but with intelligent customizations, it is not impossible to have the same design elements in our own kitchens as well. Keep in mind that the kitchen we are discussing here is not in the Beverly Hills mansion where the couple is living as of now. No, this was the kitchen in their deluxe New York City apartment that they left back in 2016, before the birth of their first child, to make more room for their expanding family. We are sure that if they could take just one room from this apartment to their new house, it would have to be the kitchen because the contrast between the dark wood and the brighter everything else in there is quite stunning. The theme in the background is generally dark here, but the rich wooden cabinets in deep, metallic grey give it a particularly classy touch of seriousness. To make sure that the kitchen didn’t end up looking too serious though, everything from the golden stools to the bright, custom made backsplash adds a healthy dose of color and vibrancy to the whole décor. Gold is quite obviously the dominant theme here, and in contrast with the dark background, it works wonders for the kitchen. This isn’t the hardest or the costliest remodeling project that you can emulate of course, but it’s quite elegant all the same. Compared to the previous kitchen of John Legend and Chrissy Teigen that we just discussed, this one is huge and more extravagant in every way, as one naturally would expect from this couple! Fortunately, it is one of those situations, which we talked about in the intro, where extravagance and good taste has been molded into perfection by masterful construction. There are beamed ceilings, a giant oven, marble/granite countertops, and a primary reliance on premium wood for just about everything from the cabinets to the floor itself. The property is in Los Angeles, of course, but by looking at the kitchen at least, you could be forgiven for thinking that this was a lavish, European country house kitchen built in a previous century. The colors are a natural mix of brown in various shades, with green on the walls. While the color combo is basic, it works beautifully with the somewhat rustic theme of the kitchen. Now that we have taken a look at some of the slightly older celebrity kitchen decors, it is time to focus on more recent times with Jensen and Danneel Ackles’s black and white Kitchen. Truth be told, black and white are certainly not the only colors in the kitchen, but there seems to be a dominance of the two colors to create a gentle contrast that isn’t too overbearing either. It’s not exactly huge, but spacious all the same and alongside the rest of the residence, black and white pinstripes can be found strategically placed around the kitchen as well. Although it is certainly not minimalist in any sense, there is a clean look to the whole kitchen that speaks of good taste and sophistication at the same time. What we like in particular is the intelligent utilization of natural light facilitated by the architecture itself. The huge windows placed strategically allows the clever architecture and design to reflect natural light coming into the kitchen from those windows, which beautifully lights up every corner of the kitchen on a bright day. This isn’t a particularly easy project though, so if you plan to emulate something like the kitchen we are seeing here, put a call in to russremodel.com since they have the experience and the expertise to get it done in the way that would best suit your home’s foundational architecture and position. 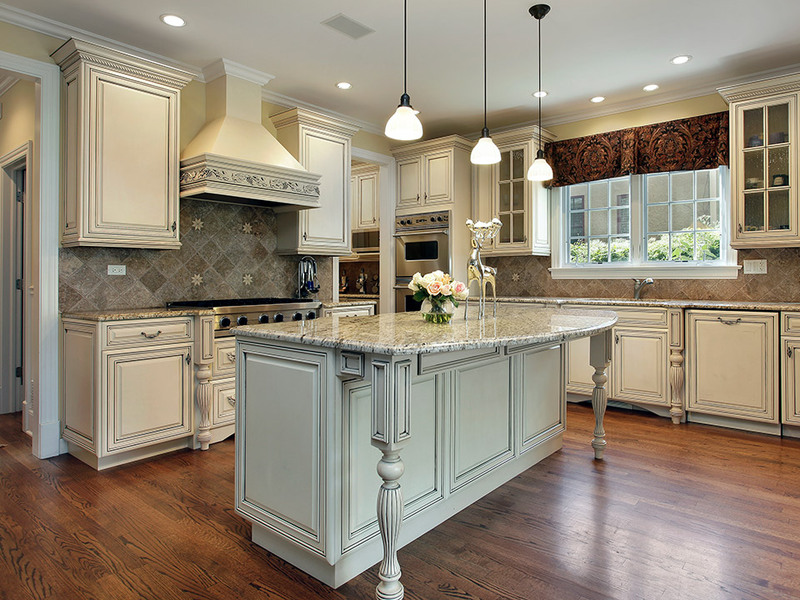 In fact, Russ Construction & Remodeling is famous in the Portland Metro region for converting even the most outdated kitchens into modern pieces of functional art. If you have the resources, you can rely on them to match any of the celebrity kitchens we are discussing on this list and improvise on them to better suit your family’s unique needs. Storage was on Macy’s priority list, as he said so himself, therefore, it is no wonder that the kitchen in their Colorado vacation home has massive storage capacity and even two giant ovens, but without making the kitchen look stuffy at all. As far as color is concerned, there’s one single dominant theme throughout the kitchen, which is a superlight, cool blue hue that almost looks white at first. Aside from a few black chairs here and a blue pot there, it initially looks like nothing from the darker shades exist in Macy and Felicity’s kitchen at all, until you glance down and notice the contrastingly beautiful shadowy, wooden floorboards. It was actually a good decision to keep the primary theme bright since the natural light coming in from the opposite window doesn’t seem to be lighting up the kitchen too well, especially since the dark floorboards are probably absorbing most of the light. Large overhead fixtures in black hang over a long countertop that’s almost the same light brown shade as the wooden structure and storage space supporting it, while the dark metallic cabinets and drawers with steel handles sit in perfect contrast all around the kitchen. The walls and the ceiling is bone white though, with only the window frames matching the color of the metallic cabinets. The floor below is textured wood with gorgeous natural grains, which adds even more contrast to the kitchen, but does so quite elegantly. This is a kitchen that injects functionality, sturdiness, and longevity into interior architecture while remaining classy and fashionable at the same time. Aside from the fact that the room is a contrast of dark and bright colors, there is also a very prominent theme of sharpness to it, since almost everything has defined outlines and sharp clear angles. To be honest, the angular pointy corners on the island look like they can be quite painful when you bump into them, but they do make the kitchen look extra sharp and help it to stand out from the rest. It’s clean, clear, sharp, and somewhat mysterious at the same time. The Coldplay guitarist is quite fond of masculine home interiors and that fact can be seen throughout the house, not just in the kitchen. There’s a dark theme everywhere, but it is always complemented with bright white on the walls and in other places to make the interiors shine. In case you have ever wondered about how a billionaire fashion mogul might choose to design his kitchen, we have the answer for you and apparently, it’s quite unique. Can the all-white, steel kitchen with only a hint of other colors be called minimalist? We are not entirely sure, but it wouldn’t be too far away from the truth, provided that you can ignore the fact that everything from the stools to the vent hood hanging from the ceiling was custom made and likely costs more than most of us would care to know! The steel cabinets are coated with lacquer, and the island in the middle looks like it has a Celador covering to keep Ralph and Ricky Lauren from suffering the painfully cold touch of steel during the winters. If you can live without the expensive customizations by famous designers though, this is a kitchen which you can have in your own home too, provided you really do prefer the all-white, clean, and steely look. As long as you have the necessary funds for it, you can just follow any one of the celebrity kitchen designs that we just discussed, but innovation and variation are still advised. Instead of blindly copying your favorite idea on this list, why not talk with your contractor and interior decorator to improve further on the design? Admittedly, it is your kitchen we are talking about here and you can use the full liberty of your ownership to design it in any way you choose to, but having that variation might help the project end up even better than the one which inspired it.